The Wandsworth Guardian reported on Friday 27 November that a cement mixer crashed into the Alchemist/Fishmonger worksite ditch in St John’s Hill Battersea, bursting a gas mains and forcing emergency services to evacuate the area. 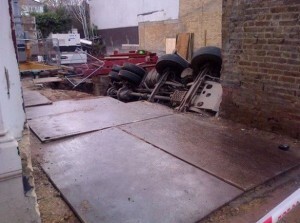 The driver is said to have walked out of the lorry. The Alchemist pub, located at 225 St John’s Hill, was nearly totally demolished last month, without planning consent (story HERE and THERE). “Whether or not the current works are in breach of enforcement notices it is our view that any works being carried out on the site do not have planning permission. We understand that the building owner claims to have implemented the approved application ref 2009/2994 by commencing work within three years of its approval on 11 January 2010. We would like to know what evidence there is that an effective start on the works was made within the time limit imposed by the condition attached to the approval. If the building owner is unable to provide such evidence then the 2010 planning permission will have lapsed. We would like to know what action the Council is taking to deal with the unlawful demolition earlier this year (May / June) of the former Fishmongers’ Arms. Is the Council satisfied that any work presently being carried out has planning permission? We are waiting for some response from Wandsworth Council.